ABOVE: Buttes-Chaumont is one of the few parks in Paris where you can picnic on the grass and, if you wish, bring your dog. 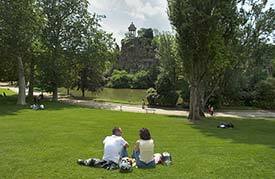 Other Parisian parks are more famous (and more visited by tourists), but the Parc des Buttes-Chaumont may be the most distinctive--and romantic--park in the city. The park, which replaced a gypsum quarry and execution ground, was begun in 1863 as the crowning touch in Napoleon III's plan for green spaces throughout Paris. The Parc des Buttes-Chaumont occupies 61 acres (25 hectares) of hilly land in the 19th arrondissement, in the northeastern reaches of Paris. Its layout and design owe more to engineers and landscape gardeners than to nature: The site was carved out of the old quarries and slums with dynamite, then outfitted with such romantic touches as waterfalls, a grotto, a lake, and a folly--the Temple of Sybil--on top of a cliff with views of Montmartre in the distance. Unlike formal Parisian gardens such as the Jardin des Tuileries, the Parc des Buttes-Chaumont attempts to recreate nature (albeit an idealized version of nature) in the style of a 19th Century English garden. If you're hungry, you can lunch at Le Pavillon Puebla (closed Sundays and Mondays, call 01 42 02 22 45 ) or--better yet--assemble a picnic lunch at a bakery such as the award-winning Boulangerie Véronique Mauclerc (in the Rue de Crimée, just northwest of the park). How to get there: Two Métro stations are at the edge of the park: Buttes-Chaumont and Botzaris on Line 7b. Another station, Laumières, is a couple of blocks northeast of the park on Line 5. If you don't mind a bit of walking, you can combine a trip to Buttes-Chaumont with a St-Martin Canal cruise to or from the Bassin de la Villette (see inset photo). Two companies, Paris Canal and Canauxrama, offer cruises of several hours at reasonable prices. Top photo copyright © Paris Tourist Office. Photographer: David Lefranc. Inset photo copyright © Paris Tourist Office. Photographer: Marc Verhille.